Afghanistan’s trucks laden with merchandizes have recently unloaded in Turkey and European markets and they will return home with importing merchandizes soon. 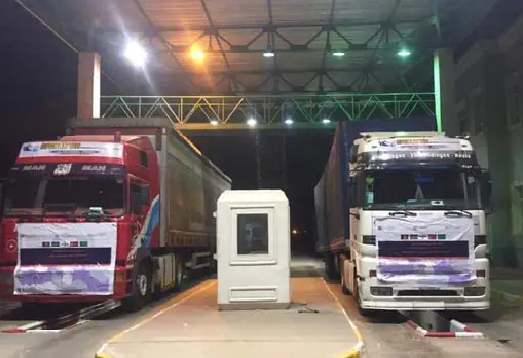 The trucks have loaded with quality merchandizes in Turkey, they have reached to Azerbaijan and will reach to Afghanistan by the next three days, the ministry of transport said. Calling government’s steps effective in term of trade, economic experts say that if the government wants to support Afghan businessmen, they would get encouraged and invest more in the country. Using Lapis Lazuli Route could be very useful to Afghan traders, as we will be witnessing reaching merchandizes’ trucks from Turkey in upcoming days and we hope our trade situaton with Turkey and regional countries gets improved, an economic expert Saifuddin Saihoon said. At the same time, a deputy minister of transport Imam Mohammad Warimach told media the trucks have moved toward Afghanistan and will reach by the next three days, adding comparing other ways, the merchandizes will reach sooner through Lapis Lazuli Route and they would cost cheaper. Lapis Lazuli Route connects Afghanistan to Turkey through Turkmenistan, Azerbaijan and Georgia. The historical Lapis Lazuli Route was inaugurated this year on Qaus 22, and for the first time, nine trucks have exported Afghanistan’s merchandizes to Turkey and European countries. Deputy to Afghanistan’s Chamber of Commerce and Industries, Khanjan Alokozay says that exports and imports through Lapis Lazuli Route can bolster trade ties between Afghanistan and Turkey. Afghanistan mostly imports foodstuffs, chemicals, cloths, furniture, electrics, carpet etc. from Turkey, he further said. It is merit to mention that Lapis Lazuli Route is the only way that can connect Afghanistan to European countries. “Our merchandizes now reach to Turkey in ten days and cost cheaper,” an Afghan trader Amrullah said. In fact, Lapis Lazuli Route could now tackle most of problems Afghan traders were facing with.